Hey Everyone! This amazing recipe was done by the awesome food blogger Karissa Besaw from The Crunchy Chronicles. I’m super excited to have her on here, especially since her skill with cooking and photography is definitely pro. She’s known for her delicious vegetarian and vegan recipes, so if that’s your jam, then head on over to her site and check it out! She has a lot of great recipes! 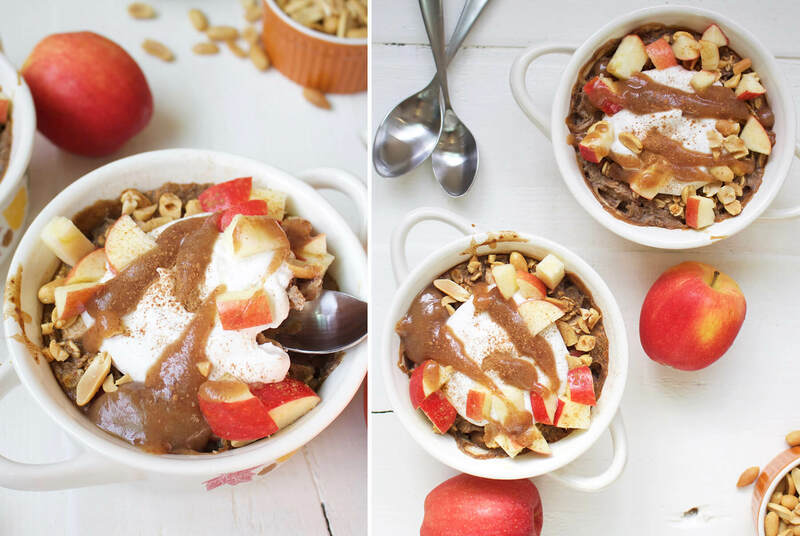 If you’re seeking a healthy and delicious breakfast idea, look no further than this apple baked oatmeal with caramel sauce! This recipe is vegan and free of refined sugar. I never even knew baked oatmeal was a thing until a few months ago. It seems to be a classic recipe that is making a comeback – and more delicious than ever with amazing flavors. “This carrot cake baked oatmeal is a healthy, breakfast twist on a classic dessert. It’s also vegan and can be made gluten-free using gluten-free oats…” Read More here! To make the caramel sauce, you will simply remove the pits from some medjool dates and blend them with non-dairy milk (almond or soy work best), water, vanilla extract and a tiny bit of salt. If you have any extra sauce, it stores easily in the fridge for a few days – it is AMAZING on top of ice cream, too! You can buy whipped coconut cream if you’re in a pinch (SoDelicious sells one found in the freezer section called “CocoWhip”) but homemade is the absolute best. It’s naturally sweetened with a maple syrup and has a lovely flavor that goes with more than just tropical dishes. Place a can of coconut milk in the fridge the night before so the coconut cream solidifies at the top. Scoop out the cream, leaving the liquid behind, and whip using a hand mixer or stand mixer until fluffy. Fold in maple syrup and vanilla extract and put back in the fridge until ready to use. The oatmeal itself is super easy – just mix together all of the ingredients (omit nuts if necessary) and pour into whatever pan or bowls you choose to use. I love using individual ramekins for baked oatmeal, but a 9×13 pan works just as well! “Veggie-packed and delicious, this salad recipe is inspired by classic greek gyros. Instead of meat, chickpeas sautéed with greek spices are added as the protein…” Read more here! Blend together all ingredients until smooth. If sauce is too thick, blend in a little more milk or water. Set aside until ready to add into the baked oatmeal. Skim the coconut cream out of the can and add into a bowl. Using a stand mixer or hand mixer, whip on medium-high speed until fluffy. Gently fold in maple syrup and vanilla extract. Place in fridge until ready for use. In a small bowl, mix together the ground flax seed and water to make “flax seed eggs”. Set aside for 5 minutes to allow the mixture to thicken. In a large bowl, stir together the flax seed “eggs” and all remaining ingredients until well incorporated. Pour into pan or ramekins. If using a larger pan, bake for 40 minutes. If using individual ramekins or bowls, bake for 30 minutes. Remove from the oven. Let the baked oatmeal cool a bit and set for 15 minutes. Drizzle with caramel sauce and add other optional toppings (such as whipped coconut cream, peanuts, apples, and cinnamon.) Enjoy!